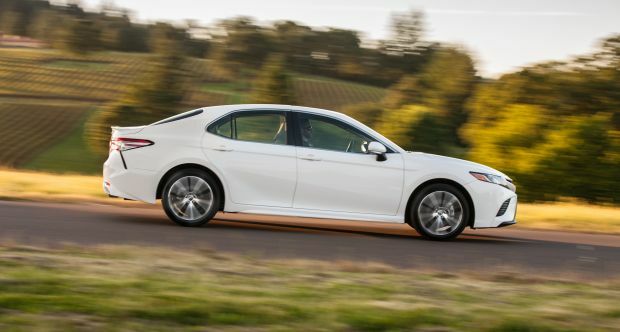 This is the best midsize sedan for you if you crave a Camry new from the ground up. America’s most popular car is fully redesigned for model-year 2018, with curvaceous new styling, revised features, and updated engines. Camry remains a front-wheel-drive five-passenger four-door. But it adopts a new understructure that introduces more engaging driving dynamics. The interior is revamped and all trim levels now come with a laudable range of safety gear, including autonomous emergency braking. The engine lineup mirrors that of the 2012-2017 generation, retaining four- and six-cylinder choices, plus a gas-electric hybrid. All are more powerful than before, however, and more fuel-efficient, too. One hybrid model is rated 52 mpg in combined city-highway driving. Citing “emotionally charged” new styling and the improved platform, Toyota says it considers the ‘18 Camry an opportunity to re-energize the midsize-car segment. That’s a tall order. With buyers flocking to crossover SUVs, the midsize-car class suffered a 16-percent sales decline in the first eight months of 2017 — on top of a 9.5-percent drop for 2016. 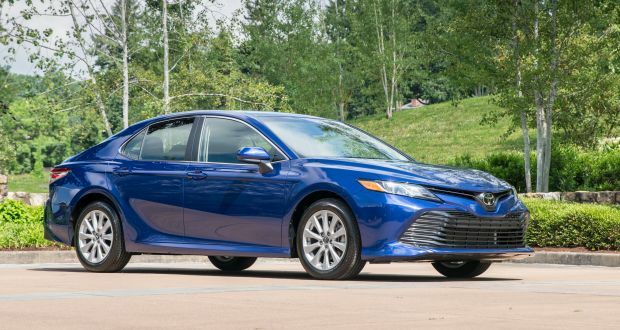 Camry sales are off 7.1 and 9.5 percent over the same periods, but the Toyota stalwart has maintained its position as the segment’s sales leader, with the Honda Accord, Nissan Altima, Ford Fusion, and Chevrolet Malibu rounding out the top five. Little reason to postpone a purchase. Coming off the full model-year 2018 redesign, the ’19 Camry is hardly apt to change in any way worth waiting for. It is likely to experience some model-year price inflation, however. And the shelf life of its styling and feature set will be shorter by a model year, pending the next facelift, probably for 2021. Buying an ’18 Camry insures you a sedan that won’t change significantly until then. It’ll keep pace with the redesigned 2018 version of Camry’s archrival, the Accord. And it’ll get you the most up-to-date version of a car that has earned the loyalty of millions for its room, comfort, affordability, reliability, and resale value. To those attributes, Toyota adds styling that catches the eye and road manners that reverse its reputation for lackluster handling. Notable new features include an eight-speed automatic transmission in place of a six-speed automatic for gas-engine-only models. Cabin-materials quality is upgraded and outward visibility improves. The ’18 Camry’s lineup again ranges from fairly basic to leather-lined fancy. The five-model range features gas-only versions of the rental-fleet-plain L, the retail-entry-level LE, and the upscale XLE. Sportier SE and XSE grades return, as well. All come standard with a four-cylinder engine; the XLE and XSE are available with the V-6. The Hybrid again combines a gas four-cylinder engine with electric-motor assist. It returns base LE and luxury XLE grades, and adds a sporty SE trim. Styling: Toyota goosed the previous-generation Camry with a model-year 2015 facelift aimed at undermining the car’s stodgy image. It brings that effort to fruition for ’18, with sharply defined curves and creases taken from the automaker’s aggressive new design language, as seen on the latest versions of its Prius liftback and RAV4 compact crossover. It’s a racy new image for Camry – it’s downright aggressive on the SE and XSE models — and just provocative enough to raise the question of how the car’s conservative core audience will react. Bumper to bumper, the redesigned Camry is just a half inch longer than the outgoing version. But its wheelbase – the distance between the front and rear axles – is longer by 1.9 inches. That gives the visual impression of a more athletic profile, as does the 1.6-inch lower hoodline and a nearly one-inch-lower roofline with a pronounced fastback taper. LED low- and high-beam headlamps are now standard, along with LED daytime running lights and LED taillamps. Larger new grilles convey some model personality: unadventurous horizontal bars for LE and XLE, blacked-out honeycomb flanked by big air intakes for the sportier SE and XSE. The new body is nearly an inch wider overall, and all versions have a slanted crease that boomerangs from the taillamps into the rear fascia, lending the rump an added impression of road-hugging width. On SE and XSE, the taillight lenses are smoked, the bumper integrates an aerodynamic “diffuser,” and the trunk wears a small spoiler. Unique to the SE and XSE are black machine-finished alloy wheels and, for the XSE, the fashion-statement option of a roof painted gloss black. Fully redone for ’18, the interior is highlighted by separate driver and front-passenger zones that create the most cockpit-like Camry cabin ever. The feeling is reinforced by gauges that for the first time are angled toward the driver. The new understructure enables engineers to lower the seating positions nearly an inch in front and 1.2 inches in back. That helps occupants feel one with the car yet enjoy better outward visibility, thanks to a more compact instrument panel, lower window beltline, and relocated roof pillars and mirrors. Front-seaters enjoy fine room and comfort. A power driver’s seat is standard on all models, and every grade but the L gives the driver a power-adjustable lumbar support. SE models upgrade from cloth upholstery to Toyota’s convincing faux-leather SofTex material. Real leather is standard on the XSE and XLE. All but the L and LE have a leather-wrapped steering wheel. A letdown is rear-seat comfort, traditionally a Camry selling point. Despite the longer wheelbase, there’s nearly an inch less legroom than before. The lower seating position preserves most of the old Camry’s headroom, even with the new car’s more sloped roofline. But the tradeoff is an unsubstantial cushion with subpar thigh support. Long-legged folks must now adopt a knees-up posture. Otherwise, the cabin is impressive. The dashboard is a splendid blend of style and function. Plenty of soft-touch surfaces, stitched upholstery, and a mix of tones and hues create an upscale ambience. Thoughtful touches standard on all models include automatic power up and down on all four side windows and sun visors with sliding extensions. Automatic climate control is standard starting with the SE; XSE and XLE have dual-zone control. They also have an electric parking brake and the convenience of brake-hold, which allows you to idle at a stop light with your foot off the brake. The interior’s small-items storage space is plentiful. And while the 15.1-cubic-foot trunk is average for the class, Toyota deserves credit for sacrificing no volume to the Hybrid’s battery pack. The TNGA platform allows for its relocation from the trunk to beneath the rear seat. Props also for giving every model above the L a 60/40 split/folding rear seatback. Mechanical: Major upgrades here, beginning with the new understructure. Called Toyota New Global Architecture, or TNGA, this modular platform is designed to underpin a variety of Toyota cars and crossovers. It’s more rigid yet lighter than Camry’s previous platform, and allows for a lower center of gravity. Combined with a re-engineered suspension, it gives this sedan dramatically improved road manners. Score another point for Toyota in its campaign to engage younger drivers and recast its old-fogey image. Indeed, the redesigned Camry feels reassuringly stable at highway speeds and changes direction with conviction, exhibiting none of the previous car’s dithering response to steering input or weak-kneed composure in bumpy turns. Cornering grip increases with wheel size. We haven’t tested the L model with, its budget-grade 16-inch tires, but the 17s on the LE furnish a praiseworthy balance of bump absorption and poise. The XLE and four-cylinder SE have 18s that encourage higher cornering speeds and don’t compromise ride quality. SE and XSE trims get sport-tuned shock absorbers and springs, with XSE models adding low-profile 19-inch tires. These are genuinely entertaining front-wheel-drive sedans that easily run with the Mazda 6 and Honda Accord, the traditional handling benchmarks in this class. Contrary to early speculation that Toyota would follow a trend in midsize-car powertrains and confine the new Camry to naturally aspirated and turbocharged four-cylinder engines, the available V-6 returns. In fact, the entire engine lineup is the same, although each offering is significantly improved. Most Camry buyers will continue to choose the base four-cylinder, which again displaces 2.5-liters but is all-new mechanically. Horsepower increases to 203 (206 on the XSE), from the 178 of its predecessor. And torque is up to 203 pound-feet (206 on the XSE), from 170. (Think of torque as the force that gets a car moving, and horsepower as the energy that keeps it moving.) Output is now at the top of the class for a base engine, and acceleration – both around town and in freeway merging and passing — is more than sufficient. Rivals such as the Buick Regal, Chevrolet Malibu, Ford Fusion, Hyundai Sonata, Kia Optima, Volkswagen Passat – and the redesigned 2018 Accord — all offer turbocharged four-cylinder engines. None of these turbo fours matches the new Camry V-6 for horsepower, although a few equal it for torque and beat it for EPA ratings. Only about 6 percent of Camry buyers traditionally choose the V-6, but the automaker retains it as a competitive differentiator, a decision made easier because the TNGA understructure is designed to accommodate other Toyotas for which a V-6 is virtually mandatory, including the midsize Highlander crossover and Sienna minivan. While the 2018 V-6 is again a 3.5-liter it, too, is a new engine, with advances such as direct fuel injection. It has 301 horsepower and 267 pound-feet of torque. The outgoing V-6 had 268 horsepower and 248 pound-feet. Available only on XSE and XLE models, the six invigorates the Camry, providing robust thrust from any speed without the lag that deprives many turbocharged four-cylinder rivals of linear acceleration. Toyota takes a step forward on the transmission front, as well. Both the four- and six-cylinder engines mate to a new eight-speed automatic transmission. It replaces a six-speed automatic and helps improve pickup off the line as well as fuel economy. XLE and XLE models allow the driver to toggle among Economy, Normal, and Sport transmission calibrations. SE and XSE models also get steering-wheel-mounted paddle shifters designed to provide manual-type gear control. Overall, the eight-speed fosters a smooth delivery of power, although its tendency to seek higher gear ratios in the name of fuel economy means it’s sometimes tardy with downshifts when you need quick acceleration at around-town speeds. As before, the Camry Hybrid combines the 2.5-liter four cylinder with electric-motor power. It’s not a plug-in, recharging instead by recapturing energy otherwise lost during braking and coasting. It uses its motor almost exclusively to assist the gas engine with acceleration. Net output climbs 8 horsepower, to 208 (Toyota doesn’t specify net torque). The Hybrid again employs a continuously variable automatic transmission, but this CVT gains a sport mode, and the SE model gets steering-wheel paddle shifters for added “gear” control. Any Camry Hybrid is among the better examples of the breed, with a seamless mixture of gas power and electric assist, ready acceleration thanks to the motor’s instant torque, and near-normal brake-pedal feel during regenerative braking. 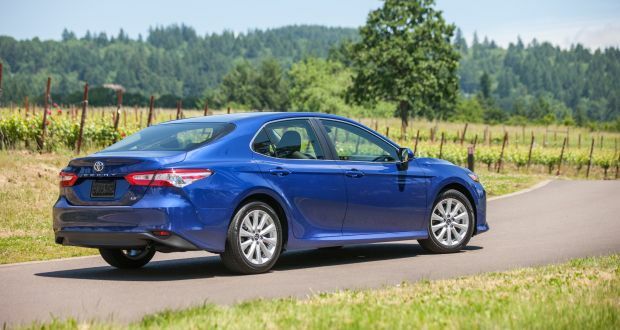 Hybrid models weigh about 200 pounds more than their gas-only counterparts, but acceleration overall feels livelier than the gas-only four-cylinder Camry, despite the characteristic CVT tendency to allow the engine to drone at high rpm until desired vehicle speed is reached. Handling is on par with the corresponding gas-only trim levels, too, helped by center-of-gravity advantages of the new battery placement. Features: Advances in safety and connectivity are the highlights. Toyota Safety Sense-P (TSS-P) is included on every 2018 Camry. This is an enhanced version of a similar set of driver assists previously optional only on XLE and XSE models. TSS-P includes radar-based adaptive cruise control, automatic high-beam headlights, and lane-departure warning with automatic steering correction. TSS-P’s most prominent component is autonomous emergency braking that can warn the driver, then slow or even stop the Camry to mitigate a frontal collision with another vehicle or a pedestrian. That capability should enable every 2018 Camry to achieve the coveted Top Safety Pick+ rating from the Insurance Institute for Highway Safety. Test results for the 2018 model were not available in time for this review, but 2017 Camrys with TSS-P were Top Safety Pick+ winners. Blind-spot and rear cross-traffic detection is standard on XSE and XLE models and a $600 option on all other Camrys. All ’18 Camrys come with a dashboard infotainment touchscreen. It’s 7-inch-diameter on most models, and 8-inch on V-6 XSE and XLE models and on LE and above with audio-system upgrades. Part of its function is to display the standard rearview backup camera, which includes the guidance of a projected path. A Driver Assist Package adds Camry’s first birds-eye surround-car view and also includes a head-up display that projects key instrumentation onto the windshield before the driver. The package is optional on XSE and XLE models, at a pricey $1,675 for four-cylinder versions. It costs $1,050 for V-6s and the XLE Hybrid because they come standard with the head-up display. Connectivity improves with the automaker’s latest Entune 3.0 multimedia system as standard on every Camry. It supports several smartphone-based technologies new to the car, including available remote engine start, vehicle unlocking and finder, fuel-level readout, and guest driver monitoring. It also offers available WiFi Connect, allowing up to five mobile devices to connect using 4G LTE. Entune 3.0 also includes smartphone-based navigation projected on the dashboard screen via the Connect Navigation Scout GPS Link with Moving Maps. For imbedded navigation that can deliver real-time GPS service absent a cell signal, you need the enhanced Entune 3.0 system. Toyota calls this Dynamic Navigation and it’s a $940 option available only on the V-6 XSE and V-6 XLE. The Qi wireless charging system for compatible smartphones is standard on the V-6 XSE and V-6 XLE, which also have a premium JBL audio system. Qi is included in the Audio Package available on all other Camrys, save but the L model. The option includes the 8-inch dashboard screen, satellite radio, and related upgrades — though not the JBL system. It costs $1,255 on the SE, $1,455 on the LE, and $1,800 on the XSE and XLE. On the Hybrids, the Audio Package costs $1,050 for the LE and SE and $1,800 for the XLE, where it does include the JBL stereo. Despite shrinking demand, Toyota believes the 2018 Camry’s advances justify higher prices. Increases average 6.8 percent for the four-cylinder models, 10.3 percent for the V-6s, and 5.5 percent for the Hybrids. The biggest is a $3,600 jump in the starting price of the most expensive model, the XSE V-6. All base prices in this review include the automaker’s $895 destination fee (note that fees may vary by region because some areas of the U.S. are served by independent Toyota distributors). The 2018 Camry L starts at $24,390, includes the standard features already mentioned, and is unavailable with options. The ’18 LE model is priced from $24,895 and replaces the L’s 16-inch steel wheels with 17-inch alloys and, in addition to the aforementioned power driver’s seat and split/folding rear seatback, adds such standard features as an anti-theft system. Base price for the 2918 Camry SE is $26,095. In addition to the black-themed styling tweaks, SofTex upholstery, and automatic climate control mentioned earlier, it includes a color-keyed rear spoiler, chromed exhaust tip, and a gauge cluster display with readouts for outside temperature and a host of fuel-economy data, such as distance-to-empty. With the four-cylinder engine, the XLE starts at $29,345 and the XSE at $29,895. The XLE builds on the LE with standard features that include automatic headlamps, chrome-finished 18-inch alloy wheels, and imitation wood and metal cabin trim. The XSE expands on the SE with the 19-inch wheels as well as quad chrome exhaust tips. The four-cylinder XLE and XSE also have dual-zone automatic climate control, heated front seats, a power passenger seat, adjustable rear headrests, remote keyless entry with pushbutton start, and an automatic-dimming rearview mirror. With the V-6, the 2018 Camry XLE is priced from $35,295 and the XSE from $35,845. These V-6 models mostly mirror the equipment of their four-cylinder counterparts, but add exclusives such as the head-up display, a more elaborate multi-information display, and a power lumbar adjustment for the front passenger seat. They also come with a panoramic moonroof, which is a $1,045 option on their four-cylinder counterparts. Among notable options, a standard-sized moonroof is a $900 option for LE and SE models. A $625 Convenience Package for the LE adds remote keyless entry with pushbutton start and the auto-dimming rearview mirror. The contrasting black-painted roof adds $500 to an XSE and includes matching rear spoiler and outside mirrors. Hybrid models cost less than the V-6s, but are priced $3,250-$4,300 more than the corresponding gas-only trim levels. You’ll need to determine whether the long-term savings on fuel costs justify the extra outlay, but lower emissions and surprisingly lively performance also factor in. The 2018 Camry LE Hybrid starts at $28,695, the SE Hybrid at $30,395, and the XLE Hybrid at $33,145. Equipment levels echo those of the gas-only trim levels, although only the standard-sized moonroof is extra for the LE and SE. EPA ratings for Camrys from the previous generation hovered a bit below average for their competitive sets. But the redesigned 2018s are among the most fuel-efficient cars in the segment. The ’18 Camry L rates 29/41/34 mpg city/highway/combined, while the slightly heavier four-cylinder LE, SE, XLE, and XSE rate 28/39/32. By comparison, all 2017 four-cylinder Camrys rated 24/33/27 mpg. The ’18 Camry XLE V-6 rates 22/33/26 mpg city/highway/combined and the marginally heavier XSE V-6 22/32/26 mpg. That’s up from 21/30/24 for all 2017 Camry V-6s. The 2018 Camry LE Hybrid rates 51/53/52 mpg, a mark exceeded among five-passenger “family cars” in this price range only by Toyota’s own compact-sized Prius. The LE uses a lithium-ion battery, which is more efficient than the nickel-metal-hydride battery in the Camry SE Hybrid and XLE Hybrid. The latter two rate 44/47/46 mpg, which nonetheless exceeds EPA ratings for midsize-class hybrid competitors such as the Ford Fusion and C-Max, Kia Optima, Hyundai Sonata, and Buick LaCrosse eAssist. The Chevy Malibu rates 49/43/46 mpg, although it has only 182 horsepower. By comparison, the 2017 Camry LE Hybrid rated 42/38/40 mpg while the XLE rated 40/37/38. The redesigned Honda Accord is expected to feature a hybrid model, possibly for model-year 2019 and possibly incorporating plug-in capability. All 2018 Camrys use regular-grade 87-octane gasoline.